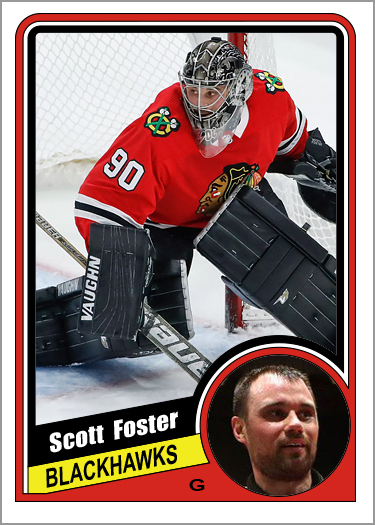 Scott Foster made NHL history last week when he played for the Chicago Blackhawks in Thursday night’s game against the Winnipeg Jets. 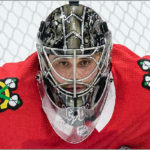 He is the second emergency backup goaltender (EBUG) to be credited with ice time in an NHL game, and the first to be credited with making a save. Actually, he made seven saves, including stops on a Dustin Byfuglien slap shot and a shot by Paul Stastny from the slot. 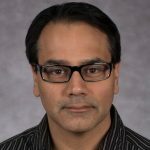 Last season, Carolina Hurricanes equipment manager Jorge Alves suited up as an EBUG for the ‘Canes, played a mere 7.6 seconds, didn’t face any shots, and yet got a bunch of official hockey cards made by Upper Deck. 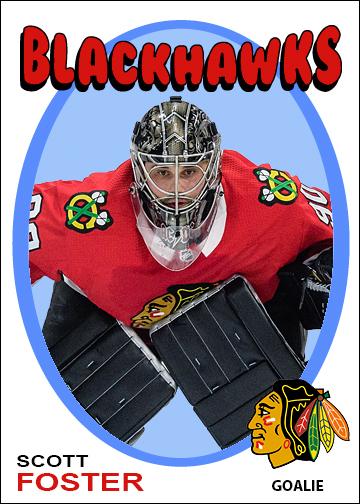 Meanwhile, Eric Semborski was coincidentally an EBUG for the Blackhawks last season, and got two digital trading cards from Topps, though he didn’t play in the game. 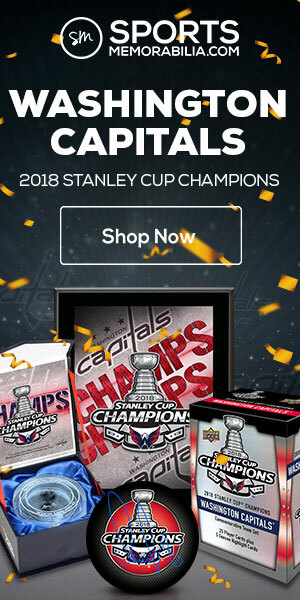 So, where are the Scott Foster hockey cards? 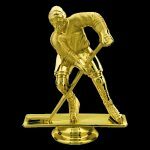 The guy actually appeared in an NHL game, which is the minimum criteria for getting an NHL card. Heck, he even used to stuff hockey cards of goalies in his skates for good luck. 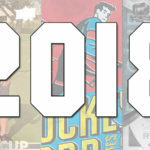 Foster might get a card from either Upper Deck or Topps later this season. 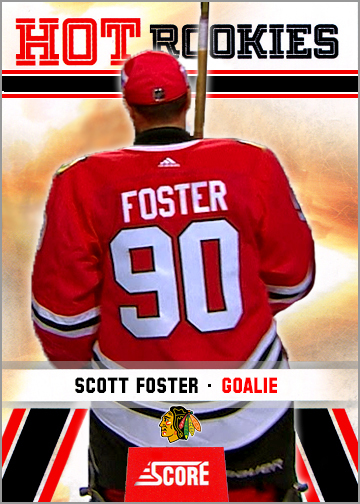 But to tide you over until then, here are seven custom Scott Foster hockey cards — one for each save he made in his 14 minutes of ice time. 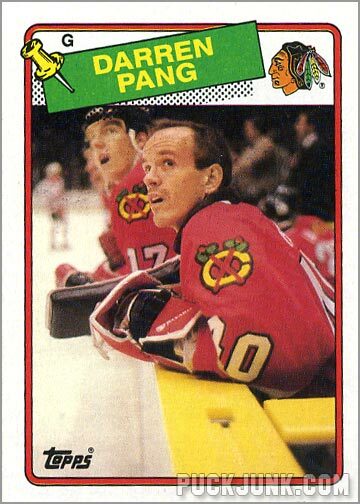 This is the best hockey card design from the 1980s, so of course I’d have to do this one. It also gives the opportunity to use a mask-less photo of Foster at the bottom. 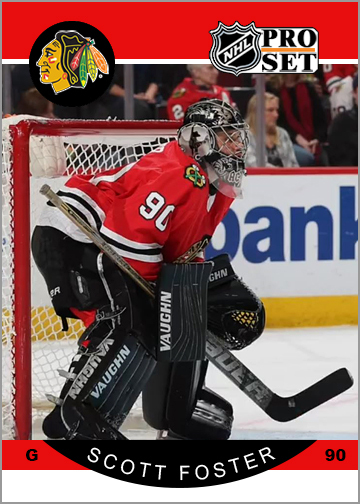 I made this one at the special request of NHL Network Radio Host Mick Kern. I think we both agree that this was the best card design from the 1970s. 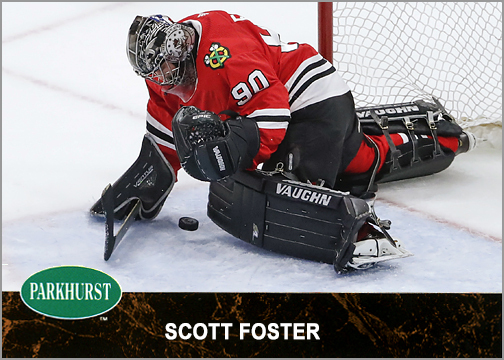 Here is Foster making that save on Paul Stastny. 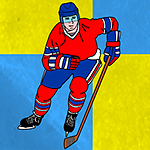 I needed to use a horizontal layout, and ’91-92 Parkhurst used both vertical and horizontal action shots, even rotating the logo when necessary. This was the season I started collecting hockey cards, so I will forever love the design, pushpins and all. 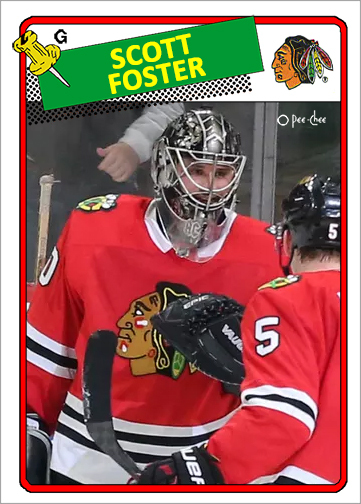 This photo of Foster about to be congratulated by the Blackhawks seemed like the perfect “non-game-action shot” appropriate for a late 1980s hockey card. 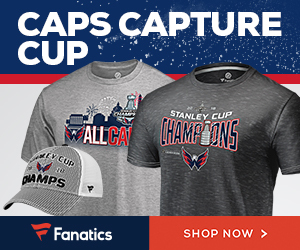 (They all seemed like photos taken during warmups or timeouts…or shots of guys sitting on the bench, such as Darren Pang here.) Special thanks to Jason Barrett over at The Cardboard and Me for help with this card. A nice, simple, mid-1990s set made when hockey cards were getting ridiculously overdeisgned. Notice that Foster looks very relaxed and poised here, as if he’s just in another game at Johnny’s Ice House. Of course, I have to represent Panini too. If you don’t get this card, here’s some context to help. 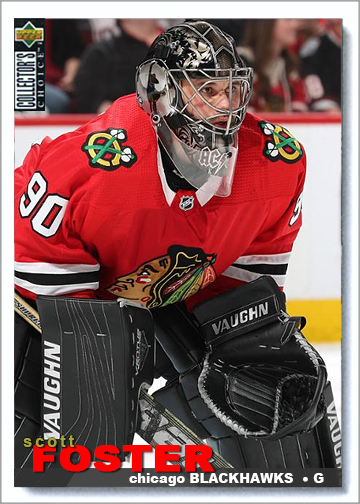 It is only fitting that I end this article about the greatest emergency backup goalie ever with him pictured on a card from the greatest hockey card set ever. Oh man, what I would give to have a copy of card #5. That is one of my favorite set designs of all time. Even though ProSet represents the worst of the junk wax era, I would love to have that specific card in my collection. I love the card you did from the 1984-85 set….and couldn’t agree more with your opinion about it being the best design from the 80’s. It’s my favourite design of all time. 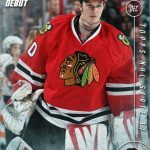 could you make some pro set error cards?!? !